Click on the images below to purchase a pattern or product in support of a good cause. harvey made landfall in my home state of texas in late august 2017, and the destruction there has been devastating. though the flood waters have receded, the efforts to rebuild will continue for a long time to come. i teamed up with my friend, artist and writer extraordinaire robin plemmons, to create this very special project. 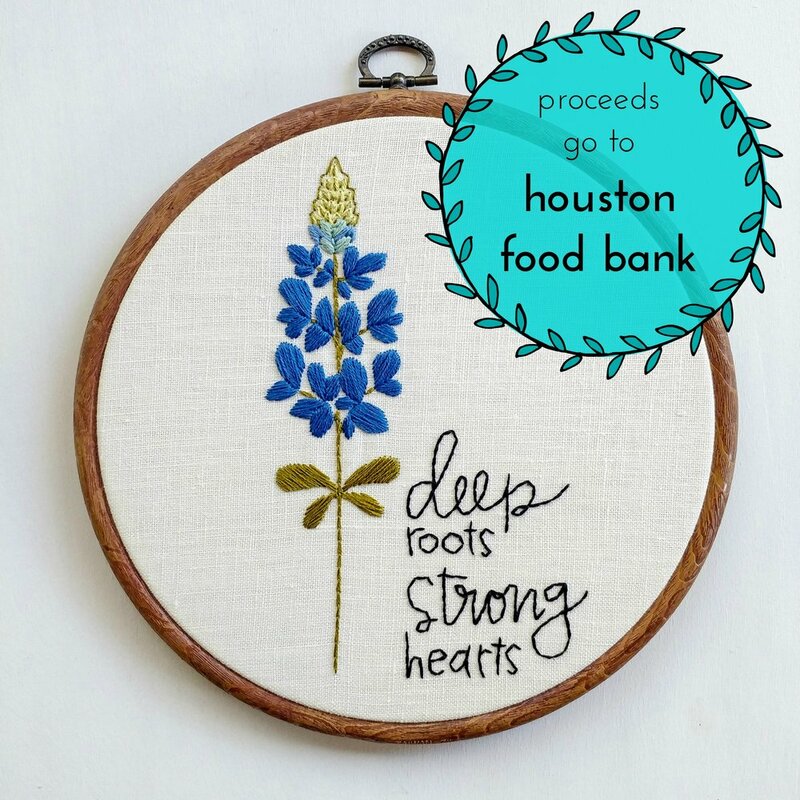 with robin's unmistakable style and my stitching skills, we created this bluebonnet design not only for the people of houston, texas, but for everyone. for all of us who care about rebuilding homes, lives, and community, through meeting the most basic of human needs, this is for you. 100% of profits from the sale of this item will be donated to the houston food bank. if you feel moved to join us, the PDF pattern is available here. 100% of my profits from the sale of the 'share the love' patches go to charities that promote and protect human rights, women's rights, racial equality, immigration rights, refugee assistance, and environmental protection. if these issues are important to you too, i'd really love your help. purchase a patch, tell a friend, help spread the word. together we can make a difference.